I just returned, along with a team of scientists and volunteers, from a successful research trip (May 15-23) to the Ten Thousand Islands (TTI), southwest Florida, where we were conducting research on juvenile Goliath Grouper (Epinephelus itajara)—the largest grouper species in the western North Atlantic (adults can exceed 3m in length and 400 kg in weight). Juvenile Goliath Grouper in a holding chamber, with water being pumped over its gills. Joining me on this expedition were: Dr. Robert Ellis, a recent graduate from the Coleman/Koenig reef fish ecology lab and current employee at FWC-Fish and Wildlife Research Institute (FWRI); Dr. Philip Stevens, research scientist at FWC-FWRI and catfish angler extraordinaire; Dr. Mauricio Hostim, visiting scientist from Universidade Federal do Espírito Santo, Brazil; and Robert Malinowski, fishing enthusiast and volunteer researcher from Wisconsin [who coincidentally happens to be my father]. Goliath Grouper are long-lived (surviving 37+ yrs) and tend to remain primarily in nearshore mangrove habitats as juveniles— until they mature and move offshore to join adults on reefs around ages 5-7, or around one meter in length. This predictable habitat shift from juvenile to adult life stages allows us to target adults and juveniles separately. 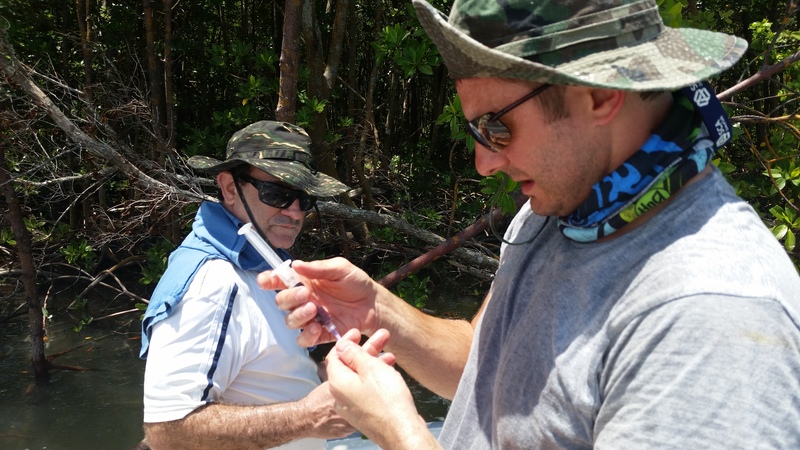 Chris Malinowski putting blood into an anticoagulant vial, after drawing blood from a juvenile Goliath Grouper. The main objectives of this trip were to catch larger juveniles (~400 to 1000 cm total length), using a setline technique with a baited 14-0 circle hook, and to obtain various tissue samples (blood, muscle, liver) to be measured for heavy metal contamination (e.g., mercury) and health impacts. 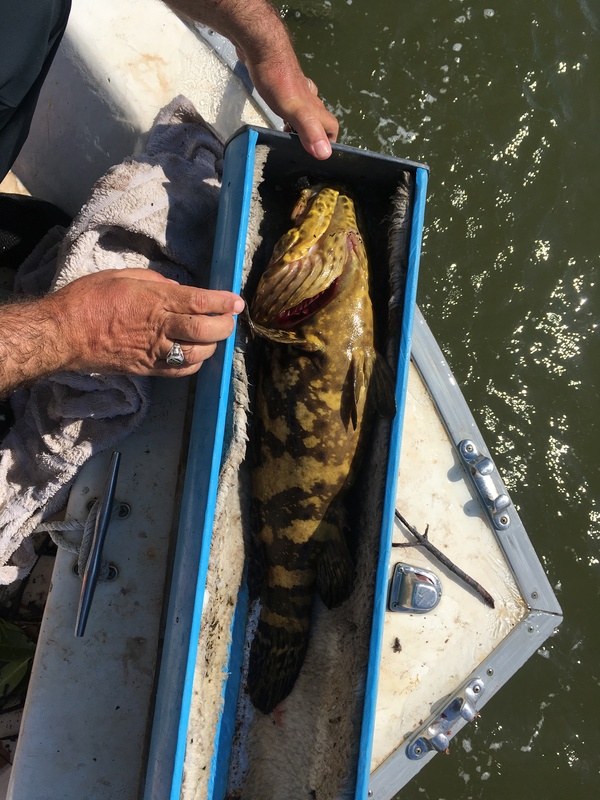 Goliath Grouper have some of the highest measured mercury levels of any grouper species in the western Atlantic and Gulf of Mexico, so we are trying to understand patterns of accumulation, including where they are getting it from and how they are impacted. Comparing results of juvenile heavy metal levels and resultant health effects with that of adults will give us a good idea of how size, age, and habitat differences factor into heavy metal accumulation patterns. The Ten Thousand Islands is a beautiful region of Florida, containing shorelines with relatively expansive and healthy mangroves, which provide essential nursery habitat for juvenile Goliath Grouper and many other fish species. 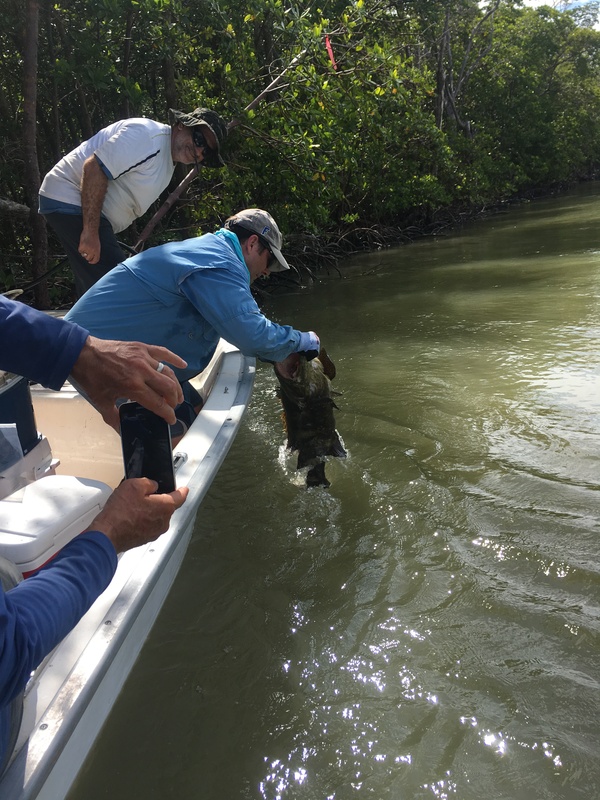 Dr. Phillip Stevens releasing a Goliath Grouper after sampling, measuring, and tagging was completed. Throughout our seven days of sampling, we visited various sites throughout TTI that we knew from previous studies, and last year’s sampling, to have the highest local abundances of juvenile Goliath Grouper. Overall, we caught and sampled a total of 9 fish. Last year we sampled 16 fish from these sites, so this was a bit lower than we had hoped. Nevertheless, a very successful trip! Our sampling methods are non-lethal, which is critical for research on a protected species of conservation concern, and because we are able to obtain important mark-recapture data. Such data provides us with details of how far the fish has moved since it was last caught, how much it has grown, and allows for mortality estimates. On this trip, four of our nine fish were recaptures from previous years of sampling. More importantly for the objectives of this heavy metal study was that two of these fish were individuals I had sampled last year for mercury toxicity. This is really exciting because I will be able to measure and compare mercury contamination in these individuals from one year to the next. Overall, between adults and juveniles, I now have about 15 individual fish that I have recaptured and sampled for mercury toxicity multiple times from one year to the next. Our fishing technique of using large hooks and bait (catfish or other live bait) can often attract other large predators, other than Goliath Grouper. We caught two bull sharks on our lines, measuring about 6 feet in length. The first one we caught really got our hearts pounding because we could see the mangrove limb, that the setline was attached to, from hundreds of feet away violently bouncing up and down. You never know what will be on the other end of the line, so it was exciting to see the action from so far away. Once we motored up to the line and realized it was a bull shark, we quickly cut the hook out of its mouth to set it free. From top to bottom: Dr. Mauricio Hostim, Chris Malinowski, Robert Malinowski. 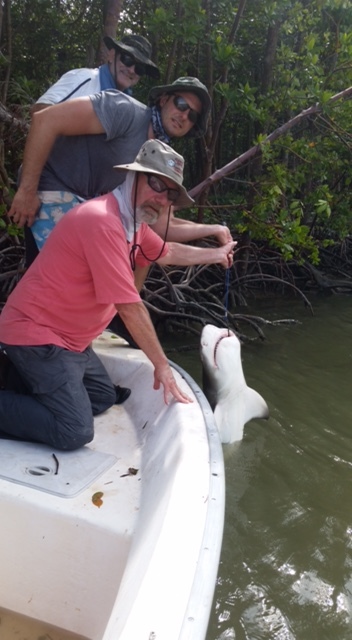 Releasing a bull shark (Carcharhinus leucas) after it was caught on one of our setlines. We also had bottlenose dolphins and multiple species of turtle (terrapin, loggerhead), and various bird species, from herons to spoonbills, visit us each day. We had one very large and curious loggerhead sea turtle following us around and coming right up to the boat to check us out for an entire day of fishing. It is a beautiful thing to be surrounded by mangroves and to see so much life around you. Visiting this place reminds me of how important it is that we maintain what is left of our mangroves, particularly because they are so critical to the health of this ecosystem—including the critical habitat they provide for the survival of so many species. We were fortunate to pair with Kevin Cunniff and Rookery Bay National Estuarine Research Reserve (NERR) for this trip. Our research crew was provided accommodations at the Shell Island Road (SIR) field station and we were able to keep our boat docked at the Goodland field station, which enabled easy access to our sampling sites each morning. The SIR field station was a great place to stay because we had a full kitchen, living area, and a full lab where samples could be processed each evening when we returned from the field. To learn more about Goliath Grouper research in the Coleman-Koenig research lab at the FSUCML, click here.